I’m doing a lot of traveling for work in the next few weeks, so I’m reliving “real” food (a.k.a. 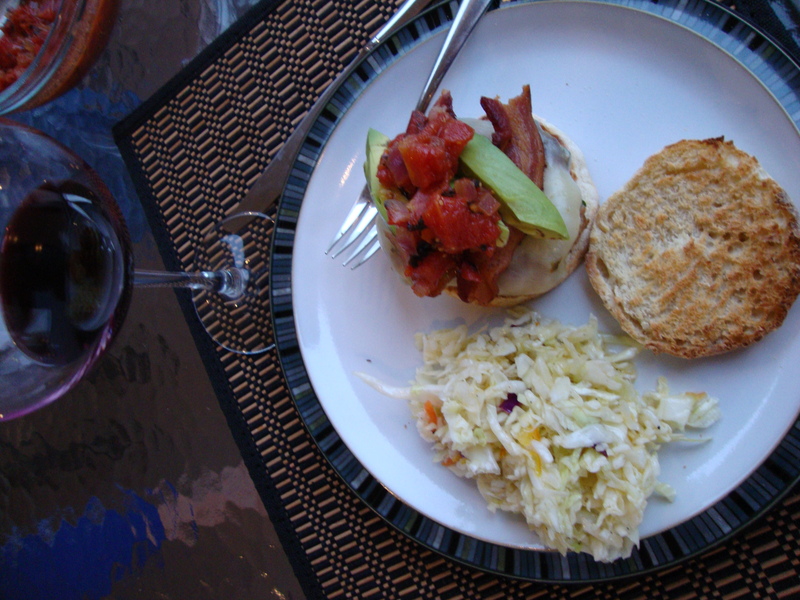 not restaurant food) with this post — Turkey Bacon Double Cheese Burgers with Fire Roasted Tomato Sauce and Citrus Slaw. Don’t get me wrong, I love eating out. Looove eating out. But after a few days I’m really craving something homemade. I’d love to have one of these burgers right about now! I made this for dinner last Sunday night with my aunt, uncle and cousin. It was a winner. If I’m going to have a burger, I tend to opt for a real, beef burger. 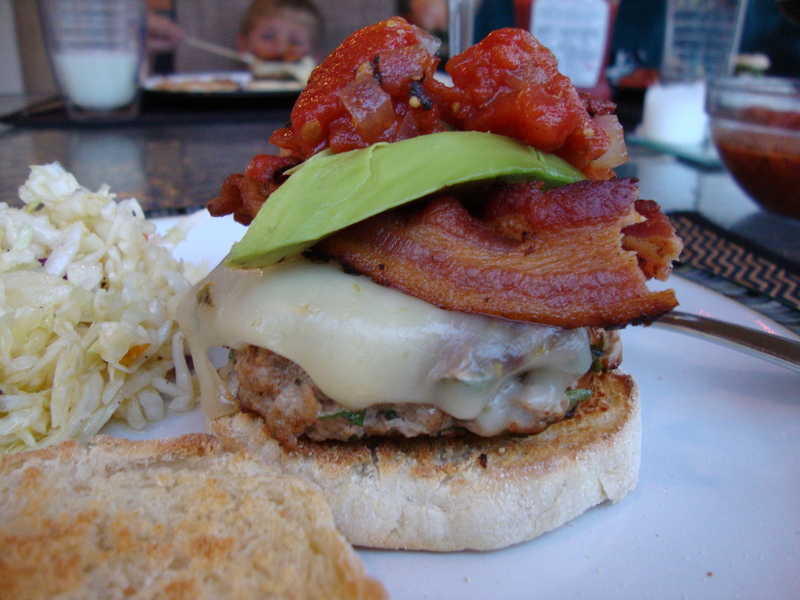 But these — made from turkey — are some of the most tasty turkey burgers I’ve ever had. You’d never guess they were turkey. The cilantro incorporated into the burger was perfect and bright — if you’re a cilantro lover, and I definitely am. The burgers are topped with a slice of spicy pepper jack cheese, then fire-roasted tomato sauce — yum. The sauce is nice and smoky and the perfect anti-ketchup (made from REAL tomatoes, thank you!). It’s worth the trouble of finding canned fire-roasted tomatoes instead of just regular diced. The flavor is much deeper and more robust. The recipe calls for double burgers, but that’s just too much, as far as I’m concerned. I used one package of ground turkey (about 1.25 pounds) and made 5 burgers. Much more reasonable, and plenty of food. I didn’t even adjust the amounts of the additions to the meat mixture — and it turned out great. I used regular bacon. Sorry, but turkey bacon is just not bacon. The slaw isn’t great the next day. I’d recommend eating it day-of, or not dressing the whole thing. Rachael talks a lot about sandwich-size English muffins, which I have never found. I used regular ones. Heat a drizzle of olive oil in a large nonstick skillet over medium to medium-high heat and add the turkey bacon. Cook until crisp, 3 minutes on each side, remove to plate. While the first batch of burgers cook heat 1 tablespoon oil in a sauce pot over medium-high heat. Add onions and soften 3 to 4 minutes, season with salt and pepper and then add Worcestershire, brown sugar, tomatoes, and mustard. Let the sauce cook on low. Add the second batch of burgers to the skillet and cook 3 to 4 minutes on each side. Top with a slice of cheese and 2 pieces bacon. Tent skillet with foil and cook on low to moderate heat to melt cheese, about 1 minute. Place burgers on muffin bottoms. 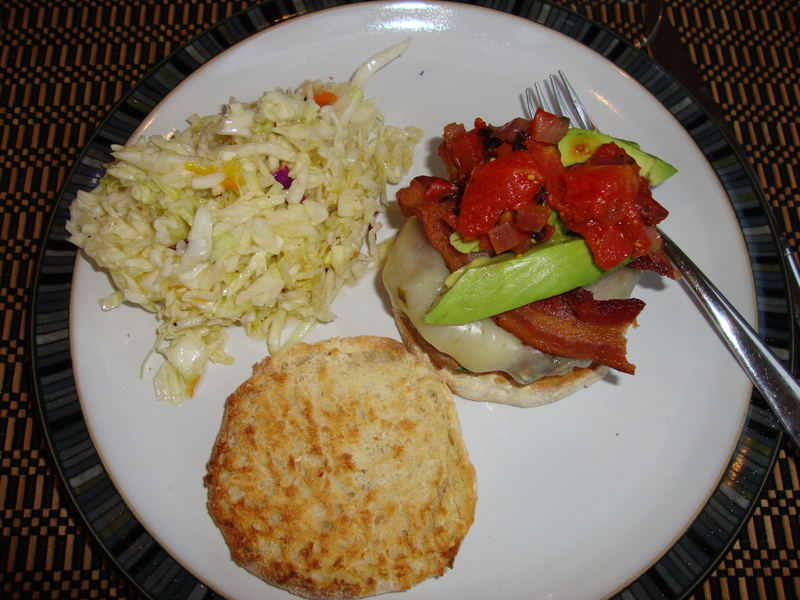 Top with bacon double cheese burgers, fire roasted tomato sauce and English muffin top. Remove metal top from jar and loosen the marmalade up in microwave 15 seconds. Spoon loosened marmalade into a bowl then whisk in lemon and lime juice, hot sauce and EVOO. Toss slaw salad with dressing and season with salt and pepper. This entry was posted in Recipes, Uncategorized and tagged Rachael Ray, slaw, turkey burger by Tricia. Bookmark the permalink. Tricia! This looks DELICIOUS. And I must agree – turkey bacon is NOT bacon. I think I might start turning to your blog to look for recipes to try! Been trying to eat out less these days. Thanks, Diana! If you try a recipe, let me know how it goes!